Many Europeans are still coming over the shock they experienced after the victory of ” Eurosceptics” and rise of the National Front (NF). Since July 2014, the NF has been dominating with 24 mandates against 14 mandates held by the ruling party. Proclivity for nationalism and enhanced patriotic sentiment in the context of globalization, integration and national interests is demonstrated not only in France, but also in other EU member states, in particular, in Austria, Hungary, the Netherlands, Italy, Greece and Denmark and in the United Kingdom, where supporters of withdrawal from the EU are celebrating their victory. At the same time, Europeans are now giving more consideration to radical parties. This trend indicates that the concept of the “European integration” at the economic, political and institutional levels is going through a crisis. French “Euroscepticism” is rooted in the deteriorating economic situation, low GDP growth and implications of these shortfalls. Another important factor contributing to the rise of nationalists was ineffectiveness of French immigration policy of the last 30 years, as well as the failure of the EU to formulate a uniform EU policy regulating the flow of immigrants. The 2015-2016 immigration crisis revealed that some countries had been putting their national interests before supranational. Although France was not affected by the 2015-2016 crisis as much as other European countries (because of language barrier, high unemployment rates and complicated refugee process it ranks only sixth among EU states in terms of the preferred place for immigration), it still disrupted the balance of political power in France and deepened dissatisfaction of French citizens with the pan-European illegal immigration strategy, especially in respect of refugees from Muslim countries. France has the largest Muslim diaspora. Almost 8 million (8.3% of the total population) Muslims, about half of whom originate in the countries of the Arab Maghreb Union, which have long-standing ties with France, but are considered a source of major terrorist threat (www.ec.eu/eurostat/statistics-explained/index.php/Files:foreign-born-population-of-birth-11January2014.YB15-fr.pgn), live in France. According to the estimates, the total number of Muslim immigrants (both legal and illegal) is close to 7%-9% of the country’s total population. Some time ago, France became a desirable destination for labor migrants from the southern Europe, who managed to integrate into the French society rather painlessly. Collapse of the colonial system de facto signaled the beginning of “colonization” of France by immigrants from former French colonies. Though these people live in a secular European state, their lives are governed by the Sharia law, which creates an awkward situation. Unlike the first wave of immigrants from the southern Europe and former colonies of France, including returnees from Algeria, the second and third generations of immigrants, who now hold French citizenship, reject European style of life amid growing youth unemployment (over 30%). Meanwhile, intensifying propaganda of Islam contributes to the rise of radicalism. The terrorist attacks committed in 2015-2016 taking lives of more than 200 people, were carried out by French citizens of Muslim origin. That provoked an amplification of anti-Muslim sentiment and an upswing in the number of incidents (attacks on mosques) and wide acceptance of the NF slogan “France for the French”. Irresponsible immigration policy balancing between the interests of the “left” and the “right” and of traditional hospitality and hostility toward immigrants has failed to properly address this important issue. 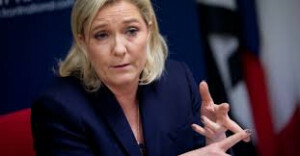 Tough statements delivered by Marine Le Pen sound like she knows what to do and appeal to certain groups of population, especially French residing in the regions with the highest percentage of Muslim immigrants (Central France, Paris, southern parts of Marseille, where the number of immigrants exceeds 25%, Lyons and other so-called “disadvantaged urban areas”). Steps taken by the right-wing and left-wing governments to control the flow of immigrants (introduction of the 180-200 thousand annual quota, tightening of the asylum process, quotas for popular jobs in some industries, issue of no more than 30 thousand temporary permits for labor immigrants, deportation of illegal immigrants, etc.) resulted in a mere 3% reduction in the number of arriving immigrants in the last five years. An 80% decrease in the amount of benefits paid to immigrants (2013) did not encourage an outflow of immigrants either. Almost 1/3 of those coming from Muslim countries prefer not to work, live on welfare, stay in France as “social tourists” putting additional strain on the already faltering French social security system. The program drafted by NF outlines rather tough measures of immigration control, including ban on family reunification; abolition of the law allowing to grant French citizenship after marriage; reduction of flow of legal immigrants down to 10 thousand per year; scaling down of the number of work visas and denial of naturalization for labor migrants; restricted access to free education and free medical care services; simplification of the process of deportation for illegal immigrants; non-acceptance of refugees; deportation of immigrants convicted of crimes or administrative violations. The issue concerning the control of terrorist threat occupies a special place in the NF program. For example, NF thinks that the Ministry of Interior Affairs should be given the right to shut down mosques engaged in the propaganda of Islam, especially those sponsored by international organizations, create a list of foreign organizations involved in aggressive actions against France and freely extradite foreigners linked to radical Islamic groups from the National Security Threat List. According to the estimates quoted by Marine Le Pen, if France tightens its immigration policy, the country could save 41 billion Euros within five years. Deportation of illegal migrants and abolition of social benefits would save it another 2.5 and 18 billion Euros respectively in the same period. The idea that an increased influx of Muslim immigrants to France and intensification of Islamization of ethnic French (some 50 thousand French have already converted to Islam) pose a major threat to the very foundation of the French lifestyle lies at the heart of NF’s immigration policy, which undoubtedly will appeal not only to the supporters of NF but also to many other groups of French population. Such restrictive measures might hurt immigrant families and could provoke anti-social behavior. While these measures are designed to encourage Muslim immigrants to look for jobs more proactively and enroll in training programs more eagerly, in the context of economic stagnation and high unemployment rates they might drive further marginalization and radicalization of the younger generation of immigrants, thus increasing the threat of terrorism. Besides, as long as the situation in North Africa and the Middle East remains destabilized, the flow of refugees and illegal immigrants (including ISIS militants) will continue posing a major threat to Europe’s security and unity. Olga Trofimova, PhD in Economics, Senior Researcher of the Center for European Studies of the Institute of World Economy and International Relations of RAS, exclusively for the online magazine “New Eastern Outlook“.